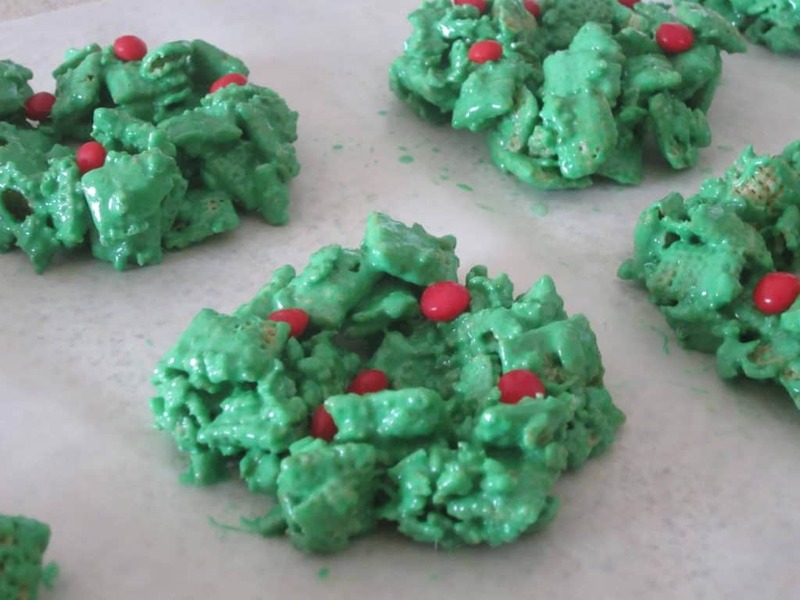 Corn flake wreaths are a festive treat that we make around Christmas time. Traditionally, they are made with corn flakes but can really be made with any “safe” cereal that is free of your allergens. Over the years, corn flake wreaths have been a staple on our Christmas cookie plate. Since eating “allergy free”, I had to change up the traditional corn flake wreath recipe. That’s because, even though corn flakes are free of the top 8 allergens, they often have ingredients derived from barley, another one of the allergens we avoid. Adapting the traditional wreaths isn’t too difficult. All it takes is swapping for another cereal such as Rice or Corn Chex. Butter would be a typical ingredient in this recipe but I use dairy free margarine. If you can’t find dairy free and/or soy free margarine (such as Earth Balance Buttery Spread), you can simply use canola oil instead. Even though these treats are a little tedious to make into their wreath-like shape, it’s worth it because the kids love them! 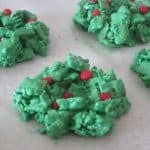 This is a traditional holiday treat with some allergy friendly substitutes to make it dairy, egg, soy, wheat/gluten, peanut, tree nut, fish, and shellfish free. In a large, microwave safe bowl, mix together the margarine/oil and marshmallows. Microwave on high for about two minutes or just until the marshmallows begin to puff up. Remove from the microwave and stir until mixture is smooth (you may have to microwave a bit longer after stirring). Stir in the food coloring. Add the corn flakes and stir until they are evenly coated with the marshmallow mixture. With a measuring cup coated with cooking spray or oil, measure out 1/4 cup of the cornflake mixture. Drop it onto the wax paper and shape into a wreath. To prevent the mixture sticking to your hands, moisten them with water. Repeat until all of the corn flake mixture is gone. Decorate with red cinnamon candies. Allow them to set for about an hour.